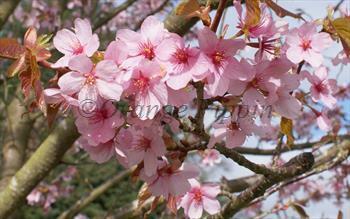 Sargent's Cherry (Prunus sargentii) is a classic flowering cherry tree, at home in any situation. It forms a reasonably large tree with a graceful upright-spreading shape, and works equally well when planted as a lone specimen tree in smaller gardens or in a group in larger gardens. Sargent's Cherry makes a fine sight in early spring, clothed in a mass of large pink single flowers, contrasting with the emerging new leaves. Although ornamental cherry trees are usually chosen for their spring blossom, Sargent's Cherry is equally impressive in the autumn, when the leaves turn an attractive golden red. Please fill in the details below and we will let you know when Sargent's Cherry flowering cherry trees are back in stock. First described in the 19th century by American enthusiast Charles Sargent, Prunus sargentii is a species of Japanese flowering cherry, which grows wild at high altitudes in the mountains of northern Japan. It is closely related to Prunus serrulata, the Japanese mountain cherry.